Smooth sumac is a Missouri native, deciduous shrub which occurs on prairies, fields, abandoned farmland, clearings and along roads and railroads throughout the State. A large, open, irregular, spreading shrub which typically grows 8-15′ tall and spreads by root suckers to form thickets or large colonies in the wild. 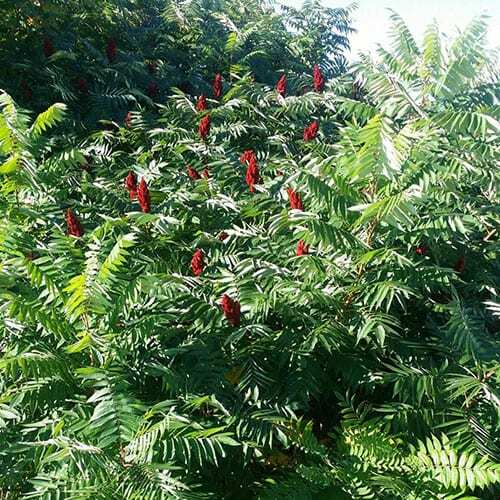 Very similar to staghorn sumac (R. typhina), except the young stems of staghorn are densely pubescent whereas those of this species are smooth, hence the common name. Large, compound pinnate, shiny, dark green leaves (each with 9-27 leaflets) grow to 18″ long with a fern-like appearance and turn attractive shades of bright orange to red in autumn. Tiny, yellowish-green flowers bloom in terminal panicles (5-10″ long) in late spring to early summer, with separate male and female flowers appearing on separate plants (dioecious). Female plants produce showy, erect, pyramidal fruiting clusters (to 8″ long). Each cluster contains numerous hairy, berry-like drupes which ripen red in autumn, gradually turning maroon-brown as they persist through most of the winter. Fruit is attractive to wildlife.